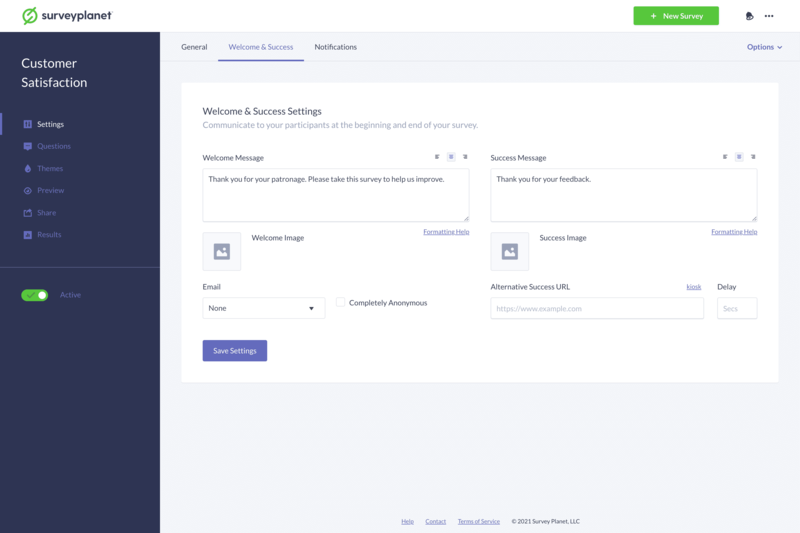 This is where you’ll change the settings whereby you communicate with your survey participants at the beginning and end of the survey: Welcome Message, Welcome Image, Success Message, Success Image, Email options and the Alternative Success URL. Enter the message you would like displayed at the beginning of your survey in the Welcome Message input field. On the Welcome & Success Settings page, click the gray image box below Welcome Image. Select a previously uploaded image from your Light Box or upload a new one. Once the image has been uploaded, click the thumbnail to add it to your survey. To delete your welcome image click Clear. To change whether you would like to ask for the survey participant’s email address, click the Email drop down and select Optional, Required or None. Optional asks for the participant’s email address but can be skipped without one being entered, Required demands a correctly formatted email address (i.e. name@domain.com) must be entered before progressing and None does not ask for an email address at all. You can also choose to make your survey Completely Anonymous by clicking the checkbox marked as such. This means that SurveyPlanet will not capture any identifying information about your survey participants, including IP address, locations, referers, browser details and operating systems. Enter the message you would like displayed at the end of your survey in the Success Message input field. On the Welcome & Success Settings page, click the gray image box below Success Image. To delete your success image click Clear. Type in the URL you wish to redirect to in the Alternative Success URL input field. When using an alternate success URL, you can also add a delay. Type a number in the Delay input field to specify how many seconds to wait before redirecting.